Sales of groceries through e-commerce platforms grew by 30% in the 12 months to March 2017, according to the report “The Future of E-commerce in FMCG” by Kantar Worldpanel, published today. The study shows that e-commerce now accounts for 4.6% of all FMCG sales globally. Whilst the e-commerce channel is growing, the FMCG market as a whole is sluggish, increasing just 1.3% during the same period. E-commerce now contributes to a record 36% of global FMCG growth and will continue to outpace growth in offline FMCG retail. 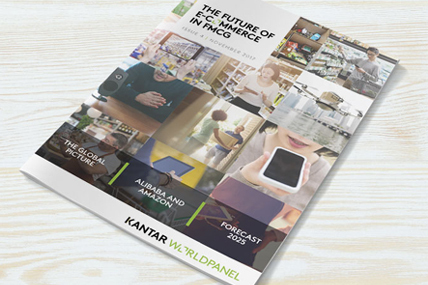 “Our projections show that in 2025, online FMCG will be a USD 170 billion-dollar business and hold a 10% market share” says Stéphane Roger, Global Shopper and Retail Director at Kantar Worldpanel. In China, e-commerce channel evolved rapidly and in the latest year approximately 60% of urban families shopped in e-commerce channel. According to Jason Yu, General Manager of Kantar Worldpanel Greater China, e-commerce giants gradually moved offline and started to transform the entire retail infrastructure. This helps to provide consumers with better shopping experience and enable brands to achieve incremental growth. In terms of absolute value growth, the top six contributors are all leading power economies, led by China and the US. The other top performing countries are South Korea, the UK, Japan and France. Last year, value increased by 52% in China, 41% in South Korea, 8% in the UK, 7% in France and 5% in Japan and in the US. However, the online grocery sector is also expanding into new markets. There has been significant value growth, for example, in Thailand (+104%), Malaysia (+88%) and Vietnam (+69%) where e-commerce is in early stages. Europe remains a continent divided. With 5.6% value share in 2016, it is the second largest market in the world for e-commerce following Asia. However, while the UK and France remain on the front foot for e-commerce – with 7.5% and 5.6% market share respectively – Germany (1.7%) and the Netherlands (2.6%) are lagging behind. Furthermore, there are signs that e-commerce is slowing down in Europe. Mature markets like France and the UK – while still evolving – are doing so at a slower rate. Known for its attachment to large format hypermarkets, online grocery penetration has increased rapidly in the US in recent months, reaching 30% of the total population. Annual spending on food and alcohol through e-commerce is this year predicted to reach $20 billion. There has been a slight increase in online grocery spend in Latin America over the past 12 months. The lack of trust in payment methods coupled with the overwhelming popularity of discount formats makes Latin America one of the most difficult regions for brands to succeed in the online world. Throughout most of Latin America, e-commerce is lagging far behind traditional methods of shopping. The exception to this is Argentina, where e-commerce is exceeding usage compared to the rest of the region. Kantar Worldpanel projections show that by 2025, online FMCG will be a USD 170 billion-dollar business, and hold a 10% total market share. South Korea and China will continue to lead the way and Asia in general remains at the cutting edge of online adoption. The big global uplift will come from the USA, predicted to rise from a 1.5% e-commerce share in 2017 to 8% in 2025. This can be attributed to the successful rollout of click and collect, delivery and subscription models, and the acceleration of disruptive models. Megacities have become natural breeding grounds for e-commerce. For example, in London, Beijing and Shanghai, e-commerce accounts for 10% of the FMCG market. “We know that e-commerce is still cannibalising offline purchases. However, there is growing evidence that online formats – in isolation – are no longer the best option for winning share. It´s about how online and offline work together to create a better shopper experience.” says Stéphane Roger. Personal care and baby care products continue to dominate the online basket. Young and time-strapped families are increasingly seeking convenience when it comes to repeat purchases of everyday households’ essentials. The perception of E-commerce has changed dramatically after Amazon’s acquisition of Whole Foods and Alibaba’s alliance with Bailian Group. Amazon and Alibaba’s strategies compared and an Interview with Kurt Li, Head of business intelligence at Alibaba show some clues. Today’s digitally adept consumers are always connected, browsing products on the move and comparing prices. It’s in this space that FMCG brands now need to position themselves. Advancements in technologies such as voice commerce and the Internet-of-things have enabled e-commerce to become a more streamlined and consumer-centric industry.